TRANSCEND MEDIA SERVICE » How Bad Is Global Inequality, Really? 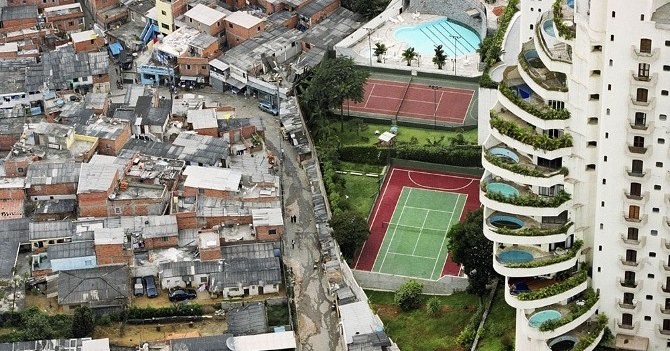 The Paraisópolis favela borders the affluent district of Morumbi in São Paulo, Brazil. 3 Mar 2019 – Most everyone who’s interested in global inequality has come across the famous elephant graph, originally developed by Branko Milanovic and Christoph Lakner using World Bank data (see below). The graph charts the change in income that the world’s population have experienced over time, from the very poorest to the richest 1%. 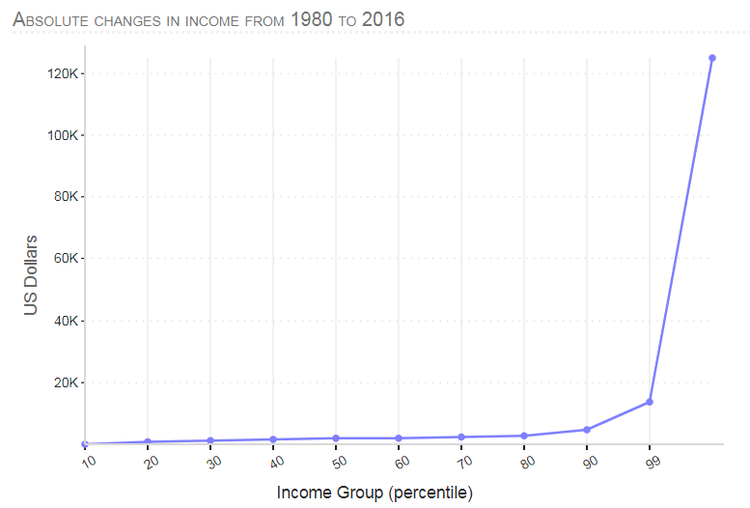 The elephant graph has been used by some to argue that neoliberal globalization has caused inequality to decline since 1980. After all, it would appear that the biggest gains have gone to the poorest 60% of the world’s population, whose incomes have grown two or three times more than those of the richest 40%. But this impression can be misleading. It’s important to recognize that the elephant graph shows relative gains, with respect to each group’s baseline in 1980. So the poorest 10-20th percentile gained 82% over this period. That sounds like a lot, on the face of it. But remember that they started from a very low base. 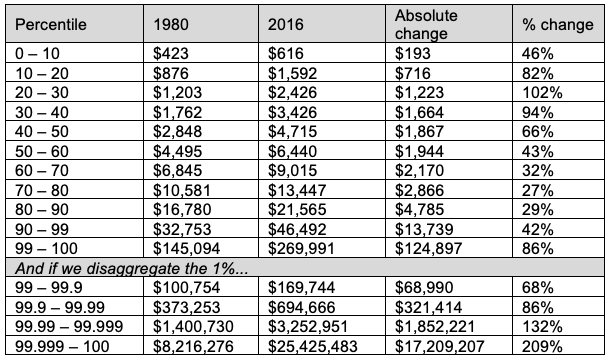 For people earning $2.40 per day in 1980, their incomes grew to no more than $4.36 per day… over a period of 36 years. So, about 5 cents per year. That’s not much to celebrate, particularly when these gains don’t come anywhere close to lifting people out of poverty. Remember, the poorest 60% – the ones depicted as the “winners” in the elephant graph – continue to live under the poverty line of $7.40 per day (2011 PPP). Meanwhile, the global rich may have seen their incomes increase by a smaller proportion, but because they started from a much higher base their absolute gains have been far greater. Suddenly the story changes. It becomes clear that it’s the richest 1% who have gained the most – by far. The incomes of the world’s poor have barely budged by comparison. It’s not an elephant graph anymore. It’s a boomerang. This seems a fitting image, given how income has an uncanny way of circling back to those who already have it. Or we could call it a scythe, which nicely captures how the rich are harvesting the world’s abundance for themselves. The results are staggering, really. For the poorest 60% of humanity, the average person saw their annual income increase by only about $1,200… over 36 years. 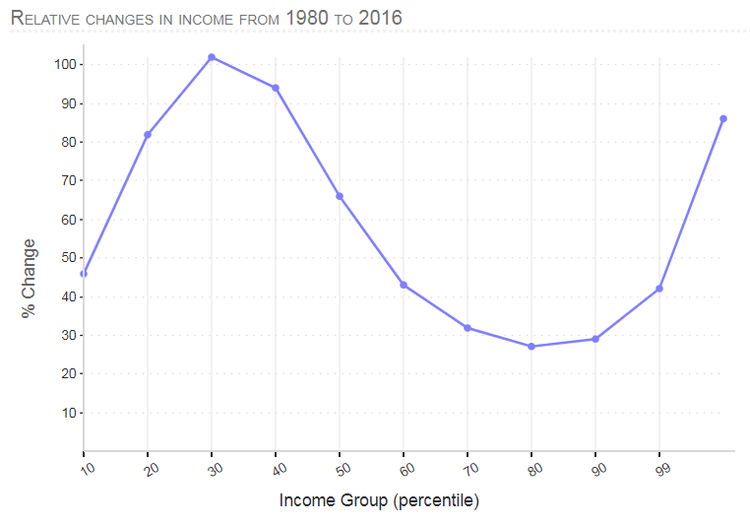 Meanwhile, those in the 70-80th percentile, the “losers” according to the elephant graph, are revealed to have gained more than twice that amount. Those in the 80-90th percentile (also represented as losers in the elephant graph) gained four times more. And the richest 1% got one hundred times more. As for the top incomes… well, they have grown by what can only be described as an obscene amount, with millionaires doubling or tripling their annual incomes, gaining some 14,000 times more than the average person in the poorest 60% of the world’s population. All of this makes it clear who the real beneficiaries of globalization have been. And suddenly it seems a bit absurd to be touting as “progress” the pennies that have trickled down to the poorest when the overwhelming majority of new income since 1980 has been captured at the top. Jason Hickel is an anthropologist at the London School of Economics. He specializes in globalization, finance, democracy, violence, and ritual, and is the author of Democracy as Death: The Moral Order of Anti-Liberal Politics in South Africa and The Divide: A Brief Guide to Global Inequality and its Solutions.